SCE hydrographers Jim Ward (left) and Jeff Sherman weigh the snow at the Emerald snow course. SCE hydrographer Jeff Sherman (left) and helicopter pilot Seth Lee get a snow sample at the Colby snow course. Aerial view of the south fork of the San Joaquin River looking towards Florence Lake. SCE hydrographers Jim Ward (left) and Jeff Sherman get a snow sample at the Emerald snow course. SCE’s Sierra reservoirs are expected to be full for summer recreation this year. 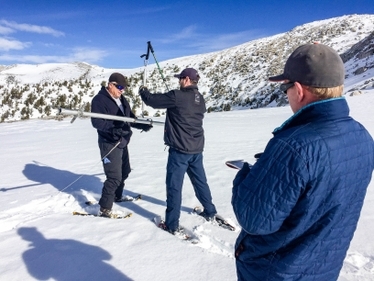 This time last year, Jim Ward and his fellow Southern California Edison hydrographers slogged on snowshoes through knee-deep snow to conduct the company’s annual snowpack survey in the Sierra. This year’s measurements at 22 snow courses in the mountains east of Fresno was easy in comparison to last year. 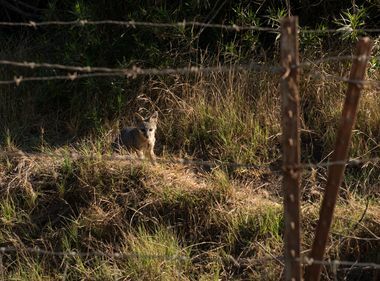 “For the most part, the surface was firm enough to walk on without snowshoes or skis,” said Ward, noting that the measurements were completed this week. The fact they had snow at all was a relief. In late January, Edison’s hydrographers measured only 19 inches of snow at some of the highest elevations — with patches of dirt visible in some places. 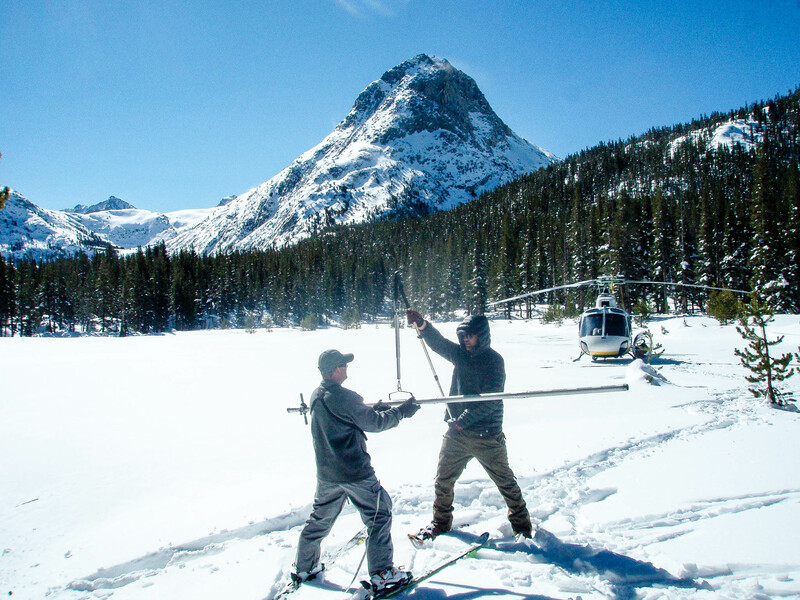 SCE hydrographer Jeff Sherman (left) and helicopter pilot Seth Lee weigh the snow sample at the Colby snow course. But a series of storms swept through in March. By the end of the month, the snowpack was at 56 percent of normal. 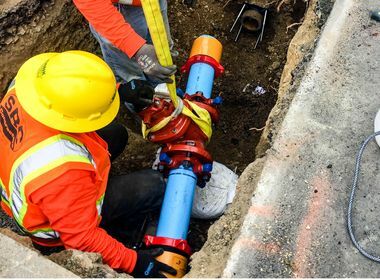 Andrew McMillan, a manager in SCE’s Northern Hydro office in Big Creek, said when you add the rain they received to the snowpack, runoff is at 63 percent of normal. Last year it was 212 percent of normal. 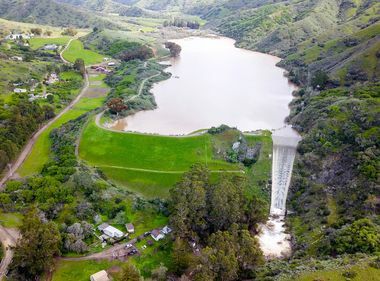 That is good news for Sierra visitors who enjoy swimming and boating in Edison’s reservoirs in the Big Creek area. We’ll be able to fill the reservoirs for recreational use. We’ll still have the High Sierra Regatta. The regatta, hosted by the Fresno Yacht Club, was canceled during the drought in 2014 and 2015 because lake levels were so low. The late-season snow also will help with SCE’s hydroelectric generation, which normally provides about 5 percent of the utility’s power. Hydro is an important part of SCE’s commitment to reduce emissions to help the state meet its clean energy goals. McMillan said the recent annual snow pattern, going from the five-year drought to near-record snow to middling precipitation this year, is not new by historical standards, but the mix of rain and snow is changing. “We are getting more overall precipitation, not less, but we’re getting more rain,” he said. That’s not good because the snowpack acts as a giant reservoir, holding the water to gradually be released as it melts instead of rain’s rapid runoff.